Harry Dresden is my paramoor, alright at least my fictional one. So when I tell you he comes back with the thunder in SKIN GAME believe me when I say he rocked my socks off. It isn’t only because the man quotes Jack Burton…because I love me some Jack Burton (1980′s movie comedy, Big Trouble in Little China) and it isn’t only because he’s one of the biggest geeks that I’ve read that makes it look cool, ok well it is cool, but he makes it cooler. It’s because he’s a character that I’ve seen grow for over ten years and heck I’m really damn attached to him. Alright sorry I couldn’t resist. So if you’ve followed the entire series thus far you know the pattern was previously one big case or major ‘oh damn’ thing for Harry to conquer per book. There were plenty of little side plots in each book but really there was one goal and mission per book to accomplish. But later in the series, everything just gets big, all the problems, all the monsters, all the ties to gosh dang everything. 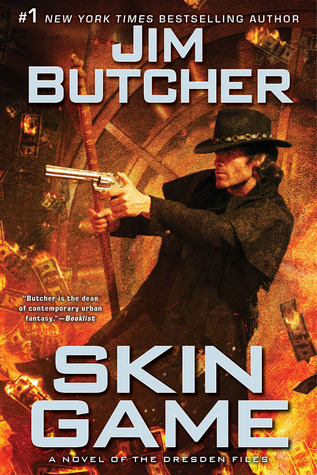 So with the mini inner trilogy of Changes, Ghost Story and Cold Days – Jim Butcher in a way took care of some of that and brought the scope of the series back under control. So we see in Skin Game, Harry is getting back into the world again and back into the one big mission story arc. Is this where the future books are headed again? Are we going to be able to enjoy a single adventure for the forthcoming books? Admittedly this was one of the things I always loved about the books and why I never felt like I was missing things if too much time passed between reading them. You could pick up any one of the books and enjoy that adventure (of course I’m a completionist and read them all in order and the short stories). Suffice to say I hope we are going back to this style of storytelling in the series. I do think though before reading Skin Game might be an advantageous time to do a series reread because some things pop up here that I just couldn’t remember all the details about from previous books. In a Heist, who in Hell wouldn’t you want at your back? A freaking fallen angel is who. How could you trust someone like that? You can’t that’s how. So when Harry is stuck working with Nicodemus on a Heist job to steal something from the Greek God of the Underworld, Hades. He’s up to his eyeballs in paranoia and surrounded on almost all sides by people he can’t trust. There are some really interesting developments that come about in Skin Game that are not to be freaking missed. If you aren’t already caught up on the series you should do so now because seriously things are getting hot, maybe just as much complicated as they are uncomplicated and always, always damn entertaining. A note on the audio version: A few books ago I switched over to listening as well as reading the Dresden Files on audio instead of reading them. I still totally plan to read this one should I happen to do a reread – but listening to James Marsters do the narration of Harry Dresden makes my news weak. He’s got such a great narrative voice, he DOES the voices – not just does them but does them well! Each characters sounds like that character to me not just like someone who’s putting on a voice to try to make them sound different from the other. When he shouts ‘Forzare’ I can see the fire raging forward. Not only that the man sounds just as good on normal speed as he does on 2x speed. I tell you if you want a really good time you’ll listen to these on audio. Sign into Goodreads to see if any of your friends have read Skin Game. 90.0% "In the homestretch now - man I love this audio but audio always takes me so much longer!" LOL Big Trouble in Little China is one of my all time favorite movies - so that he referenced him so much just made me all sorts of happy. I read the first two issues of the BTLC graphic novel over the weekend and sadly wasn't impressed. I love his pop culture references. But say it ain't so in regards to the BTLC graphic. I was looking forward to checking that out. Yes he's a king of pop culture references haha. as for the BTLC graphic - yeah the cheesey humor that I loved in the film just didn't come across well in the graphic novel. I think part of it is Kurt Russel delivers it so well that when you are just reading it you don't get that same delivery so it falls flat. So where as in the film it is oodles of entertaining in the GN I just found it blah.